There is a lot of potential for interactivity within the client project. Because we are aiming to create an environment that brings a level of authenticity with it and realism so that viewers can really get to grips with the area they are exploring, there are several different types of interactivity that I think we need to incorporate as it isn’t enough to just have the viewer walking around the level with no interactions at all. As we progress through the day, there are many different interactions that we go through with the environment around us and for the most part we barely even register them as they are a part of the norm. Something as simple as drinking and eating are a part of these interactions, and I think it might be worth us looking into a simple eating or drinking interaction within the Project Paragon level, with a food stand nearby with the user or a character being able to walk up and purchase an item of food or drink for consumption. Walking and talking to other people is another interaction that could be incorporated. Animating a character that the user can control throughout the level would offer that personal experience, especially if viewed from the first person perspective, giving the user that feeling that they are really walking through the environment instead of just looking at it. They could stand and talk to other characters placed around the environment, with each character offering a topic of conversation, with the user having the ability to offer responses and so a conversation could be held within the game. The same if the user were to go into the ticket office, they could ask the person at the desk for a train ticket and they could hand over money in exchange for the ticket. There could even be the opening of doors, as well as the train carriage doors so the user can get into different areas of the level and even enter the train carriage and sit down for when the train departs from the station. There are different ways in which we could display the level to the audience, one of which includes the incorporation of touch screen technology. Instead of having a fly through or the use of a person taking a controller and controlling a character through the level and interacting at the push of a button, it could be possible that we could use touch screen technology to create a walkthrough of the level, with the user touching a directional arrow, the camera would then take the user in that direction and then they could touch on items and the screen could zoom in on the item and a panel with information for that item could be brought up, the same with buildings that were present around the time period that we are exploring, such as is done whenever a member of the public interacts with the museum display screens that are usually located in front of a display case, with information about the display present and ready at all times. This way it could become a more educational project in which we could showcase the history of the area and some of the historical buildings of note in that time period, which could boost local knowledge and I feel that it also offers something a little bit different in terms of interaction with an environment. With technology such as Google Glass and the Oculus Rift being released recently, there could be applications for virtual reality glasses designed with the area in mind. The user could wear a pair of specially designed glasses that activate when they are placed on a person’s face, then while they are walking around the area, the glasses could showcase the exact same area, but with the buildings of the time period of the project in place of the present day buildings, so the person could actually be walking through that time period while they are walking in the present day area. They could step into the station as well and the glasses could offer information while showcasing how the area would have looked in the time period, along with the activities of that period. There could even be a small level of motion capture, for instance the user of the glasses could reach out to touch an item that is being showcased in the glasses feed, the glasses could register the motion and the user could then inspect the item closer in the same way they would if they were actually holding the item. Maybe if there is a point where there is also audio on the virtual reality glasses, there could be a commentary that could play as the user of the glasses walks around the area, so they are being fed information while they are walking along and exploring the environment in both present day and in the time period that we are working around. I think that when the project is complete, it would be kind of cool if we were able to host it on a games console, and then for the sake of authenticity, to have the member of the public that is viewing the project level through the console to have some form of interaction with it other than wielding the controller and moving around, pressing buttons to interact with the environment. Maybe if it were possible to host the project level on a console such as the Nintendo Wii, we could have it so that the player could walk around by stepping onto the Wii Board, wielding the Wii-mote and nun chuck, so when they step on the board, the character within the game walks, and when the player uses the Wii-mote, they can interact with the item in front of them, using the movement of their arms and the buttons on the controller to pick up and view items or to drop them or place them back. The other option of course is a fly through of the level, with buildings and assets highlighted as the camera flies through the level, showing off the progress of the piece by the group. The fly through could especially highlight certain standout buildings of the project as well as landmark pieces that are present within the area. There is a lot to see within the level as it is quite a large project so we won’t be able to showcase everything within a fly through, but making sure the area landmarks are highlighted is definitely something that we could look into. Interactive Environments is a very broad subject to approach with very few wrong answers as to what they are. It is easy to say that we are working within an Interactive Environment when we go to work and are sat in front of a computer, but before we even get to the workplace, we are stepping through several different interactive environments without even being aware of them. From the moment we wake up in a morning and start touching items and talking to people, we are working within an interactive environment. Something as simple as turning on a coffee machine or washing the dishes, we are interacting with the environment around us, the same can be said when we are out in public, talking to our friends, walking through shops, picking up and putting down items that we look at, these are all examples of interactions within an environment. Below are some more examples of interactions that we perform within different environments, with an explanation for different applications for the technology that we may interact with and how we encounter different pieces of technology and items within the world we inhabit. 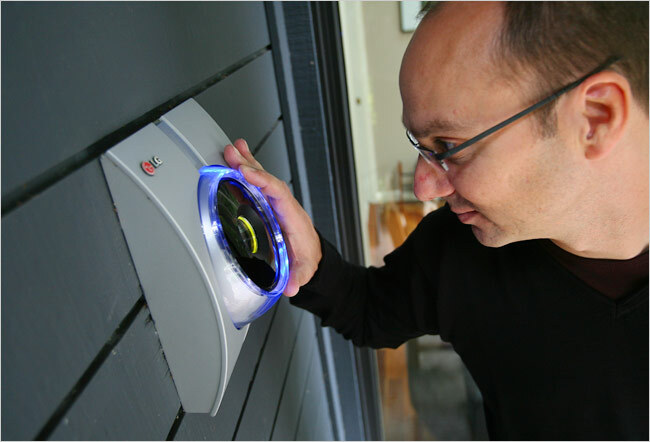 However, retinal scanners are more than just a security measure for businesses. They can be used for medical purposes as well, and are in fact used every time a person steps into an optician to have their eyes tested to see whether that person needs new glasses. The optician has their patient place their head in a braced section of the scanner, looking directly at a small lens. Once the optician has turned the machine on and calibrated the settings to be appropriate, the lens that the patient looks into sends a small laser into the eye and scans the retina for problems that may be forming in the back of the eye. The scanner then shows up the retina in an image on the connected computer screen, so the optician is able to talk their patient through the state that their eye may be in and recommend any treatment that may need to be under taken. A Patient readies themselves for a retinal scan during an eye test. While Opticians and security firms are able to use the technology for the betterment of keeping information and locations safe, or saving a patients eye sight, there have been concerns raised as to whether the technology will actually be implemented outside of these areas, as members of the public that have used such scanners have described it as unsettling, mostly due to the fact that they have to have a light beamed into their eye for between 10 to 15 seconds, which they found disorientating and left them feeling ill at ease. According to the description of the application used on Smart Phones, the user scans their eyes using the application, the sample of which is then stored in their phone. Then whenever they want to unlock their phone, they simply have to have their eyes scanned and their phone will unlock for them if it is a positive match to the sample stored in the phones database. Otherwise the phone will remain locked if it is a negative result. As is also mentioned in the application description however, it is not a serious application and the phone can still be accessed through tapping on the screen. This may be a joke application at the moment, but who is to say whether or not it becomes a real form of mobile phone security somewhere down the line? ATM’s or Cash Machines are another form of interaction, and one that we don’t really think about when it comes to interaction models. But it is quite an essential one when you really think about it. Without a cash machine, we would have to go into a bank and talk to someone, requesting the withdrawal of money and this could prove to be time consuming as there would be many people in a queue, but with the introduction of a Cash Machine, those queues don’t really exist, as these technological marvels are spread throughout towns and cities and make it easier for members of the public to withdraw money from their accounts without having to wait in a line and without having to interact with another person. From this list of options, the person touches a button on the side of the screen corresponding with the choice they want to make. The screen will then load the option the user has chosen and then they can proceed with other business. An example would be if they looked at their bank balance and then wanted to actually withdraw some money, they would be able to go back to this main menu and then by pressing a button, go to the option “Cash with/without Receipt” and then take out the wanted amount. The machine will then return the users card from the slot and then the requested funds will be released from the machine via the slot just under the main console. Cash points are a great way for members of the public to conduct their banking business quickly and without having to go into the bank itself. However, there are some risks that come with the technology. Over recent years there have been reports of gangs using small pieces of hardware and cameras to log users PIN numbers as they are entered into the console, thereby gaining access to the user’s bank account through the machines, which they could then hack at a later date using the stolen details. This is always a concern as having funds stolen from bank accounts is a breach of privacy and is also theft, so users have to be very careful when it comes to using the machines, making sure they shield their PIN number from sight at all times while using the cash machine to conduct their business. 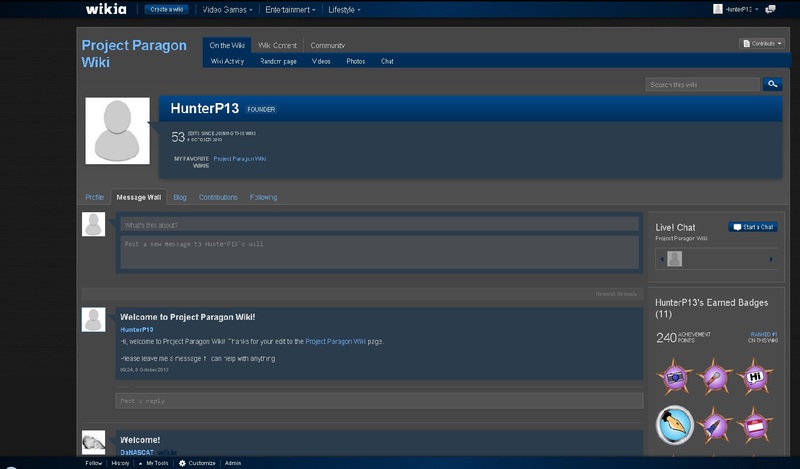 The project paragon wiki is another of the interactive environments that I wanted to talk about. The page was created at the beginning of the semester so that the team had a place where we could share our information and findings with one another, while being able to share it with the public at the same time. Firstly, it lets people add their own information and expand upon the existing information on the page. When I say this, I mean that anyone that goes onto the wiki page can add information and edit the information that already exists on the page. They can also add extra pages to the main page, with its own topic of information, then add images and information to that page then go back to the main page and create an active link that gives other users the opportunity to flick between pages to the information that they wish to view. This is a good way to set up the wiki because it gave us the chance to display all of our information without having one page cluttered up with all of the topics that we had information on, such as vehicles, weapons and buildings of interest within the project. It gives users the ability to communicate with one another and keep an active blog. Users that are signed up to the wiki are able view other members of the wiki and thereby send them messages. This is done by posting a comment on a user’s “Wall” on their profile, where the user can then send a reply to that comment, and other users can see the exchange. There is also an additional little feature on the site that is useful for us all and I feel that we could utilize a lot more as the project progresses, the personal blog spots. Each user has a blog spot on their profile where they can write up notes and information that they think might be useful, or they may want to talk about work that they have been doing and show examples within the blog posts; and other users are able to view these blog posts. This way the team could keep up with each other’s activities if they are unable to talk to them face to face or over some other form of communication, it keeps people in the loop, helps the user keep their work organized and it just generally a useful little feature that could contribute to our university blogs as well. 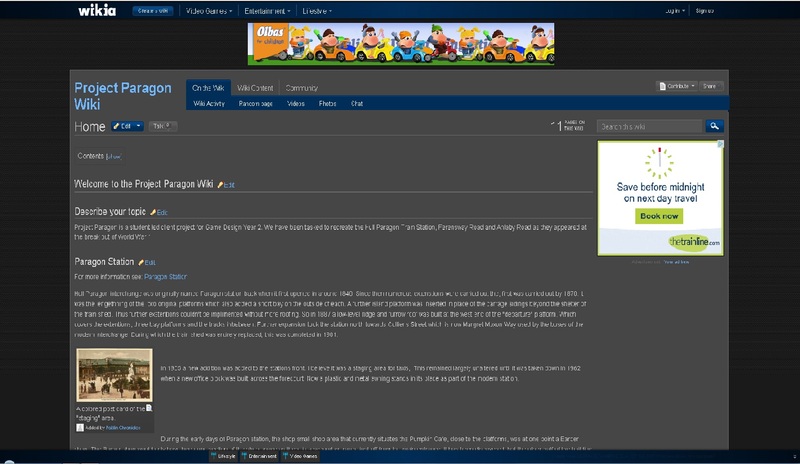 Users aren’t just limited to the Project Paragon Wiki either, because they are a registered user with the Wikia host site, we are able to check out other wiki pages that are currently hosted on the site, so we can give and be given help and advice from other users on how we can improve our blog and how to set it up to make it look and feel like a professional page for our project and the information we are displaying. There are several other little features that proved to be quite interesting, such as the Badges feature. This is a little side feature that we found within the settings and decided to incorporate as it places an aspect of Gamification on the page. Each user can earn badges by performing certain tasks on the wiki page or by adding so many items such as editing information or adding images and videos onto the pages, the more the person does, the more badges they earn. There is even a small rankings table that charts the progress of the users on the page, along with the badges they have earned and how many points they have earned from their badges as they reach achievements. This tied in quite nicely with the Gamification experiment that was conducted in the first year when we were all entered into a table and our progress was charted through our progress in our work, so it was a nice little side feature and interest that we were able to pick that up on the wiki page as it inspired us to work harder and place more information on the wiki not just so that we could earn the badges and points, but also because we needed to have that information there in the first place and this gave us a little nudge in the right direction. Cash registers are one of the most common interactive devices used in modern times. The cashier uses the touch screen if a customer orders an item through the store, navigating several different menus until they find the requested item. Alternatively, if there is a self-service area within a supermarket, such as is present within Tesco and other supermarkets today, the customer can browse the store and put the items they wish to purchase into their basket before going to the self-service checkout and scan their items, pay for them, receive the receipt and then leave with their bagged items. The cash machines in modern times also come with a card reader for those customers that wish to pay for their items through their bank card instead of using physical money, which is another interaction because the customer has to place their card in the reader and enter their pin number for the card before the transaction can be completed. There have been many different designs for the cash machine throughout the years but it is worth noting that the general shape has stayed the same, with only the technology upgrading as time has gone by. Of course there are the video games themselves. These games have been used for much more than just entertainment purposes, as I am going to explore within this post, talking about both the entertainment and the practical applications that have come about in recent years. Whether the player is on their own or with their family playing games either on the consoles or in some form of board game or maybe even a game created by the family themselves, they tend to be entertaining and fun along the way, with the whole family chipping in and spending time together while playing a game that they all enjoy. Interaction with the games themselves comes in many forms, mostly through the interaction of moving pieces or characters with either their hands or a controller to nudge them across a screen or even using a mouse to click and move pieces. Hearing is also an interaction if the game comes with sounds, or whether it is someone reading out a ruling or making a sound effect to add more atmospheres to the game. If the game requires bodily movements with more than just the hands, in the game Twister for example, where the whole body is used, this is an interaction, because the player is getting involved with the game and they are interacting with the environment that the game is in front of them or around them. No matter what form the game comes in, whether it is on a screen or on a board or even just some pieces or pure imagination and the players themselves are the pieces, games require a level of interaction from the participants. Of course, as I mentioned, games have been given more than just an entertainment value, and so we shall have a sneak peek into this practical world in which they are expanding. The first thing that I want to talk about when it comes to medical applications is the Nintendo Wii. This console was among the first, if not the first to use a controller that required the player to be stood and actively working to complete their games, the controllers responding to the arm and body movements of the player and moving the characters and game pieces accordingly in reaction. This technology has evolved beyond just being a game; it has developed a base in the medical world as an exercise machine and a physiotherapy component. Above is an image of a patient using the Wii board as part of their physical therapy session. The board measures a person’s weight, balance and stance and helps them interact with games such as Wii Fit and Wii Sports. Games have also found a use within the medical profession for those that are undergoing rehabilitation after an accident or surgery, with games being used to help strengthen them up again slowly, also through the use of the Wii, but also through other games, quickening their reflexes and helping them get through their recovery a lot more smoothly. Games such as Zumba and the Wii Fit have also been used in small community areas, with the organizers setting up a hall so that the public can go along and be part of a community exercise drive, using these games for dance and yoga sessions as forms of exercise. It offers something different and allows the people the chance to have fun while they exercise. 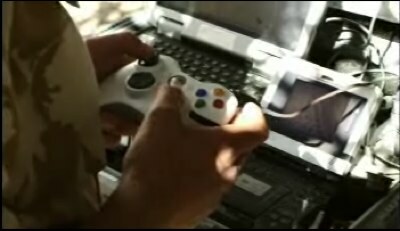 The military are also beginning to see the benefits of games, with them using first person shooters and real time strategy games to strengthen and enhance the reflexes and strategic thinking of their soldiers, while also using gaming technology to pilot their own unmanned units, an example being the use of Xbox 360 controllers to control their unmanned spy drones. Touch screens have become quite a big thing in recent years, especially in the area of mobile phones and the newly introduced tablets, which people can use while on the go to play games, check emails and do many other things (the same as with a computer). Mobile phones such as the iPhone and Android phones, which come with more power than the older generations of phones, allowing the user to push them further and use them in an increased capacity. Mobile gaming is a growing industry, with games for tablets and phones being created and released so people have things to play while on the go, along with many other applications that people can download and use while they are travelling, or even when they are stationary or at home. The touch screen eliminates the need for a keypad on the phone, as a digital variant is provided when the user wants to make a call or send a text or email. Being able to use their fingers or a stylus to navigate their phones has been simplified for a lot of people, especially those that have trouble navigating with a physical keypad, however, there are those users that find the touch screen to be a hindrance on phones, as they may have big fingers and find that navigating a phone with a touch screen to be a problem unless the screen is huge. Tablets are easier to navigate with their touch screen due to the fact that the tablet tends to be a large screen with a small border and the icons for programs, making it easier for people to navigate, as the icons are all a fairly decent size for people to press on. The navigation of the tablet is simplistic as well as the user needs to only use their finger to press on an icon, or sweep their finger across to access a different set of icons depending on what they are looking for, and since everything is ordered into groups of similar programs or the most used, it is easy for users to find the programs or games that they want to use, instead of having to travel through many folders and file locations to just find the one thing that they want to use. Looking back at the Interactive Environments, I decided to go with the touch screen displays that are present within museums. These basic touch screen devices are placed in front of displays throughout the buildings so that visitors can use them to find out additional information about the topic on display in front of them. These devices often come with an audio component too, so that the visitors are able to watch videos and learn more about the topic that they are interested in at the time and they can interact with the displays instead of the displays just being a presentation that moves from slide to slide, offering the visitor the chance to look up specific parts of the information instead of having to read through everything to find a specific piece of information. Often in museums the touch screen displays will also have games on them for children visitors as well so that they can learn about history or other subjects without having to just read, instead they can interact with the subject matter and through that they will learn more in a shorter space of time instead of just forcing them to read pages of information because it just won’t stick in their minds and that would prove to be a futile effort, whereas they get to have fun while learning on a touch screen display that offers games for them to play based on the subject matter. It’s much better if the subject matter can be engaged and the visitor can interact with it because it is more likely that information will be passed on and stick in the mind of the person, because not everyone learns the same way so it is good for museums to offer different ways to learn about the subject matter instead of just offering a lot of writing with some pictures, some people prefer learning in a more interactive and laid back environment where they can engage in the subject at their leisure. It also helps that the touch screen displays themselves are set up so that they can be used instantly, this means the visitor can interact with the information available instantly instead of having to have the display set up specifically for them, meaning they can dive straight in instead of having to spend time waiting for the information to be found and loaded. There is also no need for the visitor to sit through a tutorial on how to use the display as they are set up in such a way that the visitor can just start touching the screen, search for the information that they want to learn about through the touch of a virtual button and then they can get on learning about the subject matter. Facebook is a social networking site that was created by college student Mark Zuckerberg back in 2004. It quickly spread and became a worldwide hit with the public as it gave people the freedom to post their pictures, inner thoughts and questions in a domain where their friends and family could see them and comment and send replies and answers. It also gave people the freedom to add their friends and families onto their own personal “friends list” as they could set their profile settings to private, meaning anyone wishing to view their page had to be on that list otherwise they would be locked out of that persons “private” world. I use the word private loosely there as a social networking site rarely brings about that sense of privacy that people tend to crave. As we all know it is pretty straightforward when it comes to using Facebook, everything is laid out in a nice, neat and tidy format that people can interact with and work their way around with minimal effort, even those that aren’t very computer savvy can get away with using the social networking site. As can be seen in the screen shot, everything is nice and simple; the example above is a little outdated but it still does the trick. Facebook is nice and simple with a layout that just about anybody can navigate if they look hard enough, of course as we all know, changing our personal settings can become a bit of a headache which is fair enough because let’s face it, if things were too easy it would take the fun out of finding things. The chat box is in the bottom right of the screen, out of the way but instantly accessible to those that wish to send a message to their friends instantly, or if they prefer to send a message to their friends that they can view at a later date, then they can go into their messages or click on their friends name and leave them a message in a message box, their friend will then receive a message notification in the top left of their screen, indicating that they have a new message from someone they know. Users can easily switch from the homepage of Facebook and slide on over to their own personal profile, where they can then upload photos, personal thoughts and other interests to their “Wall” where others on their friends list can view them and leave comments. They can of course also do this through the homepage, but some people are a little touchy and like to work through their profile instead. They can also look through their existing photos and their friends list if they need to find someone that they need to message. When I first signed up to Facebook at the behest of a friend, I was a little sceptical to say the least as it was a brand new website that was unlike anything I had seen before and of course, when you are only a teen, you never think it is going to last. So I spent a little time on it and soon I was talking with friends from other towns and villages that I would otherwise only see when I was in school or I would be able to bug my parents from my room, it was all good fun and the time I spent on the site soon began to creep up and up as more time was spent surfing around on it. Over time they also started to include games on the site for people to play, offering them something else that kept the site running, because instead of people going to other websites to play games, they could now play games while they were talking to their friends on Facebook, which was of course pretty neat and now an entire gaming culture has grown as Facebook has expanded its domain and the list of games that can be played has grown with it. Facebook is without a doubt a successful website and one that is likely going to be hard to beat anytime in the near future, it is addictive and a great way to stay in touch with friends and family that have either moved away or you haven’t seen in a while. It also offers you a place to air your thoughts about things and get peoples feedback, even if sometimes they do think that your sanity or morals may have taken a nosedive off a cliff, but that’s just people for you. Motion capture hardware is on the increase in application in certain industries, namely Film and Games. Animation films are the most common environment for motion capture suits, as directors hire actors to wear the specialist suits as shown in the image above so that they can recreate realistic character movements within the animated film, instead of the traditional frame by frame drawn animation films. Tom Hanks wearing a bodysuit, recording a scene for the film The Polar Express in which he played multiple roles. 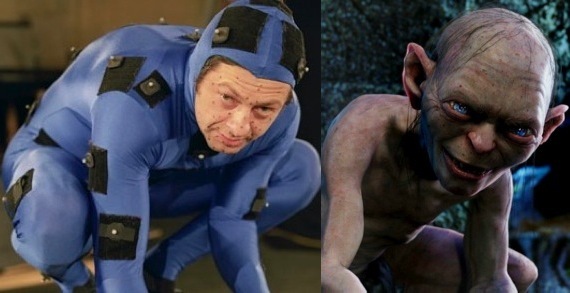 Andy Serkis in his bodysuit as he assumed the role of Gollum in the highly popular Lord of the Rings film series. In terms of video games, motion capture can be used a lot to help create realistic cut scenes in a games story (Call of Duty, Battlefield) to enhance the player experience, but the technology is also finding new applications in the form of console accessories; such as the Xbox Kinect. 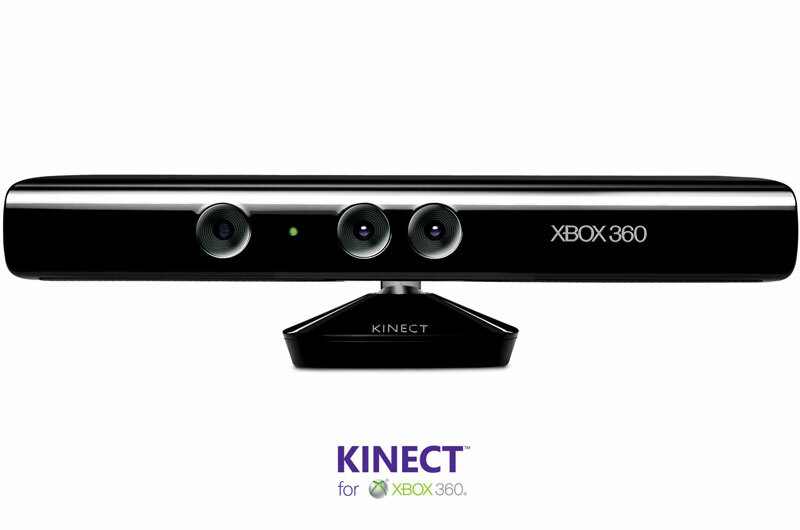 The Kinect is a unique form of console accessory in that the player doesn’t have to use any form of controller to make it work, it can be accessed through voice commands and there are no wires or nodes for the player to connect to themselves for it to recognize their movements, they just have to stand a certain distance in front of the camera. The player standing in front of the Kinect accessory, which is usually placed in front of the television or on top of it, can then use their limbs to access games and applications on their Xbox. There are a number of games that are Kinect use only, meaning the player has to stand and use the Kinect in order to play these games. The main use for the Kinect is for players to have fun playing their favourite games while getting exercise, but it also offers a unique way to play a game, as the Nintendo Wii and the PlayStation Move require the use of a controller, whereas the Kinect relies solely on the movements of the player for in game interactions and movements. Interactive Environments are something that need to be observed when it comes to level design and just design in general because it can help designers work on interactions within their designs and make their levels and characters a lot more authentic and help the player enjoy the game more if the player interacts with an item or another person in the correct way, instead of it being robotic and not have that flow that helps a player immerse themselves within the game as easily. Interactive environments are also worth looking into and researching because it can help designers learn how items help to shape an environment and how they fit into the overall picture that the environment is building up, an example would be a cash register, you would see them in stores and you would see them being used by customers at self-service aisles in supermarkets, but you wouldn’t see them out in an open field full of farm animals. Researching through Interactive Environments helps to broaden the mind as to what an interactive environment is and how we interact with the world around us. It definitely helps when it comes to designing an interactive environment as the designer needs to create something that is as authentic as possible and get all of the little interactions in the right place and have the character interact with them in the correct way, otherwise it can ruin the entire environment and sense of immersion for the player when they pick up the finished product. However, retinal scanners are more than just a security measure for businesses. They can be used for medical purposes as well, and are in fact used every time a person steps into an opticians to have their eyes tested to see whether that person needs new glasses. The optician has their patient place their head in a braced section of the scanner, looking directly at a small lens. 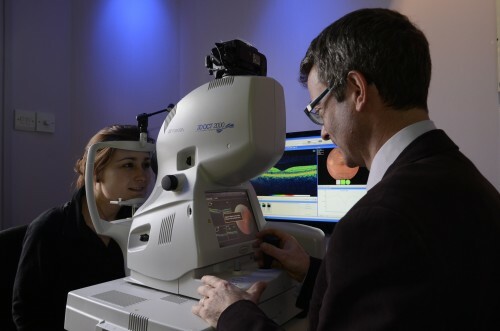 Once the optician has turned the machine on and calibrated the settings to be appropriate, the lens that the patient looks into sends a small laser into the eye and scans the retina for problems that may be forming in the back of the eye. The scanner then shows up the retina in an image on the connected computer screen, so the optician is able to talk their patient through the state that their eye may be in and recommend any treatment that may need to be under taken. From this list of options, the person touches a button on the side of the screen corresponding with the choice they want to make. The screen will then load the option the user has chosen and then they can proceed with other business. An example would be if they looked at their bank balance and then wanted to actually withdraw some money, they would be able to go back to this main menu and then by pressing a button, go to the option “Cash with/without Reciept” and then take out the wanted amount. The machine will then return the users card from the slot and then the requested funds will be released from the machine via the slot just under the main console. Cash points are a great way for members of the public to conduct their banking business quickly and without having to go into the bank itself. However, there are some risks that come with the technology. Over recent years there have been reports of gangs using small pieces of hardware and cameras to log users PIN numbers as they are entered into the console, thereby gaining access to the users bank account through the machines, which they could then hack at a later date using the stolen details. This is always a concern as having funds stolen from bank accounts is a breach of privacy and is also theft, so users have to be very careful when it comes to using the machines, making sure they shield their PIN number from sight at all times while using the cash machine to conduct their business. Firstly, it let’s people add their own information and expand upon the existing information on the page. When I say this, I mean that anyone that goes onto the wiki page can add information and edit the information that already exists on the page. They can also add extra pages to the main page, with it’s own topic of information, then add images and information to that page, then go back to the main page and create an active link that gives other users the opportunity to flick between pages to the information that they wish to view. This is a good way to set up the wiki because it gave us the chance to display all of our information without having one page cluttered up with all of the topics that we had information on, such as vehicles, weapons and buildings of interest within the project. It gives users the ability to communicate with one another and keep an active blog. Users that are signed up to the wiki are able view other members of the wiki and thereby send them messages. This is done by posting a comment on a users “Wall” on their profile, where the user can then send a reply to that comment, and other users can see the exchange. There is also an additional little feature on the site that is useful for us all and I feel that we could utilize this a lot more as the project progresses, the personal blog spots. Each user has a blog spot on their profile where they can write up notes and information that they think might be useful, or they may want to talk about work that they have been doing and show examples within the blog posts; and other users are able to view these blog posts. This way the team could keep up with each others activities if they are unable to talk to them face to face or over some other form of communication, it keeps people in the loop, helps the user keep their work organized and it just generally a useful little feature that could contribute to our university blogs as well. Hearing is also an interaction if the game comes with sounds, or whether it is someone reading out a ruling or making a sound effect to add more atmosphere to the game. Of course, as I mentioned, games have been given more than just an entertainment value, and so we shall have a sneak peak into this practical world in which they are expanding. This technology has evolved beyond just being a game, it has developed a base in the medical world as an exercise machine and a physiotherapy component. Above is an image of a patient using the Wii board as part of their physical therapy session. The board measures a persons weight, balance and stance and helps them interact with games such as Wii Fit and Wii Sports.